Is the market for flat roofing materials in the Netherlands similar to the British market? It is quite difficult to analyse market developments in our industry. Most producers are not always open and sales figures from roofer are not always transparent. A Dutch market journal conducts an annual survey of market participants, on sales and actually installed m2 material. It is only an opinion survey, but over the past five years we can see a reasonable picture of the developments and shifts in the market. There is a clear shift from new construction to renovation. Renovation remains about 6-8 million m² behind. In total, 12 million m² roofs are being renovated, this means that the Dutch market has become a typical renovation market. The survey gives a good comparison between the different types of flat roofing. In this we see a clear trend, the traditional bituminous roofing losing ground in favour of synthetic membranes. But also within the synthetic group there are visible shifts. 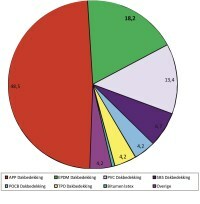 In 2006 EPDM had a market share of 10% and was the fourth choice for flat roofing in the Netherlands. Now, just seven years later, EPDM is the second choice with 18.2%. Within the synthetic group EPDM has clearly taken the lead. With a 45% share in that group, EPDM underlines its explosive growth as the accepted roofing system in the Netherlands. Every three years an international research is conducted with a study on the market shares of the different flat roofing materials in European countries. Once again, the trend shows, that the sales of synthetic products is growing at the expense of bituminous systems. Within Europe bitumen still play a prominent role. Over the period 2004-2008, the share of bitumen decreased from 79% to 74.3%, but is still substantial. Synthetic increased by 33% from 80m² to 106m² and is still growing, with a market share of almost 15% for the EPDM. For the UK and Ireland the total flat roofing market in 2011 was approx. 27 million m² and expected to grow to 30.5 million m² in 2016. The share of EPDM in 2011 was 6% and is expected to be almost 8% in 2016.